Dover—The Delaware Department of Transportation (DelDOT) announced, in support of the Delaware River & Bay Authority’s (DRBA) construction project on I-295, DelDOT has added access to the DRBA’s six live cameras to the DelDOT App and DelDOT.gov website. 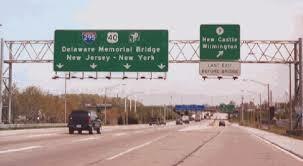 The fourth and final phase of the I-295 Delaware Approach Road Improvement Project to the Delaware Memorial Bridge started in mid-February. The cameras, which cover the approaches to the Delaware Memorial Bridge and its toll plaza, will be of special use to travelers while the DRBA proceeds with the I-295 Southbound Reconstruction project through 2018. DelDOT provides live video from over 100 cameras statewide with up-to-the minute traffic data, and the addition of the six DRBA cameras will help motorists stay informed and avoid delays in the area of the construction project along I-295 and U. S. Route 13 in New Castle County. The DelDOT App and DelDOT.gov website provide users with access to live cameras throughout the state as well as real-time reports on traffic conditions, DelDOT projects, news, and more. The DelDOT App is available through Google Play and The App Store. For more information on the I-295 Delaware Approach Road Improvement project, visit www.drba.net.